Cast: Seann William Scott, Johnny Knoxville, Jessica Simpson, Burt Reynolds, Willie Nelson, M C Gainey, Lynda Carter, David Koechner. Story: The good ol' boys gettin' up to no good in the General Lee. Whoa. You're really not going to like The Dukes of Hazzard. It's Cannonball Run cheesey but with a sense of humour that tastes of Marmite. However, if you're one of the lucky few with eccentric tastes, Marmite and cheese go together like lager and vindaloo. Maybe I've just got used to enjoying movies after this summer's bumper crop, or maybe I just like cars too gahd-daym much, but I revelled in this daft movie and loved every minute of it. Personally I could watch the General Lee jumping bridges all day long. Yeehah, apparently. The Dukes of Hazzard is pretty faithful to the original 70s TV show in its own way - Boss Hogg threatens the town, there's a fight in the Boar's Nest and the General Lee spends most of the time going sideways or flying. They even freeze-frame while the narrator makes his sly comments. Sheriff Rosco, however, is now a looming intimidator rather than a simpering fool, Rosco's little fat buddy Boss Hogg is no longer little or fat - he's Burt Reynolds - and the tongue-in-cheek comedy is a touch left-field. Hardly surprising really, as the director Jay Chandrasekhar was also responsible for the dryly chucklesome Super Troopers and has also directed episodes of the brilliant TV comedy Arrested Development. Jay also shows up as a deadpan campus policeman in reference to his earlier movie. I can't honestly say the comedy is going to make many people laugh, but it did me, and I suspect it will work for fans of Chandrasekhar's previous works. Seann William Scott (Stiffler from American Pie) is a supremely talented comic actor, he only needs to turn his head to make an audience chuckle. Johnny (Jackass) Knoxville is, on the other hand, not a natural actor or comic, but in the capable hands of Chandrasekhar, his Luke Duke plays nicely off Scott's Bo. Country singer Willie Nelson is a little flat as Uncle Jesse and everyone else y'alls and drawls their way through the sharply dark script, all the time making fun of the whole redneck thang while still creating a warm and lovable atmosphere. And as for the General Lee, well it's looking and sounding as fine as ever - there can't be many '69 Chargers left, and there are even fewer after making this! Yes, we're treated to the usual hundred-foot jumps with dirt streaming from the wheels, the car lands, destroying the chassis and shoots off down the road in perfect nick ... I love it! Great immature car chases, really great. Some day the mountain might get 'em but the law never will. Viewed objectively, there's not much going for the Dukes of Hazzard and I can't recommend it to most people. I had a ball with it though, perhaps because I loved the original series and still watch it now for the familiar warmth and fuzziness. The movie takes all that and adds some sharp humour to the mix, adding a new dimension. You really have to be in tune with it though, otherwise it'll just seem like pappy nonsense. And that, as they say, is that. Y'all come back now, y'hear? Testosterone Satisfaction Rating: 3/5 The General Lee has some marvellous sequences that had me grinning like a schoolboy. To enjoy this film you should: Enjoy the warmth of the TV series and the humour of Super Troopers. The Dukes of Hazzard is on general release in the UK now. This film is shot to ribbons by most people, it's not supposed to be straight and detailed it's an excuse for some great car chasses as well as Jessica Simpson in a bikini, how is it not a good movie? 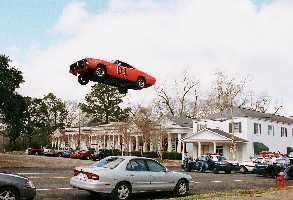 It's got no plot, it makes Southern Boys look like a bunch of rednecks but boy can those stunt drivers drive. I went to see this not expecting to find a story but just to see a 69 Charger go through its paces as the General Lee and I was not disappointed. I loved this movie. Jessica Simpson was hot! !